https://www.shmula.com/wp-content/uploads/2019/03/5-Principles-of-Lean-Thinking-300x264.png 300w" sizes="(max-width: 372px) 100vw, 372px">Lean thinking has played a major role in helping original equipment manufacturers (OEMs) prime their processes for continuous improvement. And when it comes to Lean, there are five foundational principles every manufacturer needs to know, according to The Lean Enterprise Institution. There’s no magic behind these steps; just proper understanding to make sure all Lean initiatives turn out successful. These principles are essentially strategic steps that must be followed in order since each of them builds upon the other. 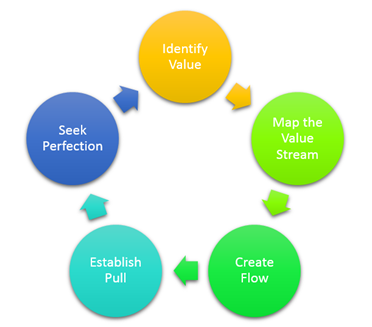 The five principles of lean are: identify value, map the value stream, create flow, establish pull and seek perfection. Keep on reading for a better understanding so you can use them to your advantage. To begin the Lean approach, there needs to be an understanding of what value means to your target consumers. This is instrumental in creating satisfied customers; which without, all manufacturing efforts would be for naught. By identifying value, not only will you be able to create something customers will pay for, but also a price point that is acceptable to them. To identify the value, you need to ask what the customer needs and why they need it. Once this is achieved, what remains to be identified is how you will deliver that value to them. When you identify these two things, it is safe to consider everything a waste, meaning you can eliminate these things. How does value flow through the organization and end up in the hands of customers? More specifically, where does it get stuck during the flow? These are the important questions that are answered by mapping the value stream. In this step, every process that brings the organization close to its end goal (adds value) is mapped. After the processes have been mapped, those which increase wastage are isolated and eliminated. Only those processes which add value are the ones that remain. And in most cases, this ends up just being 10% of them. Once the value stream stops flowing, wastage will be the inevitable end result. Once the flow of value is understood in the previous step, it is now time to create a value chain where the flow is uninterrupted. That is to say that every process that remains should be one that adds value. At this point, wastage starts to get eliminated to create a smooth flow of value to the end user. There should be little-to-no waste in the process, meaning the overall manufacturing process should now start to witness some improvement. However, it is important to understand that not all waste-producing processes can be eliminated, and time shouldn’t be wasted on this war of attrition. With value now flowing through the value chain, it comes down to letting customers pull value at the time when they need it. This means no creating value ahead of time (this leads to the need for storage and waiting for customers to make orders), but striking a balance between production and demand, which saves a lot of valuable time and resources. Now that the value has been identified, value stream has been mapped, the flow has been created and pull has been established, it is time to seek perfection. You do this by going back to the first step and doing everything all over again to achieve a state of perfection. The lean changes should not be a once-off event if you wish to reap the full rewards of the manufacturing process or any other business process for that matter. When you go through a round of eliminating wastage in a process, it can make hidden sub-processes that cause wastage to emerge. You need to continuously eliminate them as they arise to unlock the full potential of the overall process. Now that you are familiar with the principles of Lean thinking, you can use them to improve manufacturing and other business processes. These strategic steps are essential for the success of Lean initiatives. They are kind of like a recipe for a cake – you can’t bake one without it. Let the principles be your guide. The post 5 Principles of Lean Thinking appeared first on Shmula. Lean Minute Episode #1	The post Lean Minute Episode #1 appeared first on EHIIP Consulting.